Psalm 37:25 -I have been young, and now am old; yet have I not seen the righteous forsaken, nor his seed begging bread. You are the righteousness of God in Christ Jesus; that is why God will exempt you from anything that will want to make you beg in the name of Jesus! Shame will come to an end in your life! 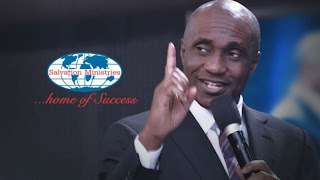 Many people are walking the streets of life without hope; they cannot even give account of their lives but as a child of God, I came to tell you that your case is different! The entire world may look bleak but in the midst of gross darkness, God will cause you to be exempted! He will turn around every dark situation in your life to good in the name of Jesus! Hardship is not new. There had been hardship in the time of Abraham that he had to relocate to Egypt because of famine. There was severe famine in the time of Isaac and God instructed him to remain in Philistine. Even in the time of Jacob, there was still famine that he had to send his children to Egypt buy food. In the time of Joseph, there was famine too and in the time of Jesus, there was no food in the wilderness. In the above cases, God ensured that He separated His own. Therefore, what is happening now is not new. If God exempted his own in the midst of hardship, then the time of your exemption has come! You don’t pray against hardship; it is part of God’s agenda for the end time. There was a time in Egypt when there was pestilence but the people of God dwelling in Egypt were exempted. You will not appreciate light until there is darkness. Sinners will not be humbled until there is hardship. It is in the midst of hardship, when they trust in their wealth and their wealth fail them as you blossom as a child of God, that they will say, “Of a truth, you serve a living God”. No matter the hardship in the world, you will be exempted; your case is different in Jesus name! Ex. 8:22-23 -And I will sever in that day the land of Goshen, in which my people dwell, that no swarms of flies shall be there; to the end thou mayest know that I am the Lord in the midst of the earth. 23 And I will put a division between my people and thy people: tomorrow shall this sign be. Ex. 9:26 – Only in the land of Goshen, where the children of Israel were, was there no hail. This is how your case will look like! When the world is complaining of disaster and difficulty, you will be celebrating the goodness of God. No matter the retrenchment, it will not get to you! No matter the evil, you will be separated in the name of Jesus Christ! You will be exempted! Gen. 47:27 -And Israel dwelt in the land of Egypt, in the country of Goshen; and they had possessions therein, and grew, and multiplied exceedingly. The children of Israel grew and multiplied when there was famine in Egypt. This was because they were covenant children. Don’t mind what is happening in the world now; have no fear because your case is different. There is nothing new under the earth. If God has done something in the past, it will not be a problem for Him to repeat it. If God exempted His people when there was severe hardship, doing it again now will not be a new thing to Him. You will have surplus when people are talking about lack; you will have more than enough! Not minding the city you are residing, the evil happening in that city will not happen to you! Though you are in this world, what is happening to the world cannot happen to you because your case is different! You are God’s own; you are programmed by God to be exempted. No matter what is happening in this world, you don’t belong here because you dwell in a new-testament Goshen. Think like that, act like that, talk like that and it will be like that in Jesus name! Refuse to be afraid; you cannot suffer what the world suffers. Isaiah 60:1-3, 10-11 -Arise, shine; for thy light is come, and the glory of the Lord is risen upon thee. 2 For, behold, the darkness shall cover the earth, and gross darkness the people: but the Lord shall arise upon thee, and his glory shall be seen upon thee. 3 And the Gentiles shall come to thy light, and kings to the brightness of thy rising. 10 And the sons of strangers shall build up thy walls, and their kings shall minister unto thee: for in my wrath I smote thee, but in my favour have I had mercy on thee. 11 Therefore thy gates shall be open continually; they shall not be shut day nor night; that men may bring unto thee the forces of the Gentiles, and that their kings may be brought. You will hear good news because God’s glory will come upon you! It is the glory of the Lord that makes a difference in a man’s life. If God’s glory is upon you, you become a centre of attraction. When God’s glory follows a business man, he does not need to lobby; anywhere he goes, doors open for him. God’s glory will distinguish you and no devil can erase it! It will be as God has commanded! Job 5:22 – At destruction and famine thou shalt laugh: neither shalt thou be afraid of the beasts of the earth. In famine, you shall laugh! This means that when there is hardship in the world, you will be laughing because you will never be a victim. Destruction and famine is already in the world but God said you will laugh! Therefore, believe it, say it and act it and you will see it in Jesus name –Amen!! !